MISSION, KS--(Marketwire - Feb 21, 2013) - (Family Features) Getting dinner on the table fast during a busy week need not cause a panic -- or a call for carryout. With this simple recipe and five key ingredients, supper is served in just 20 minutes. Begin with a pantry staple that can be the starting point for lots of great meals -- a can of READ German Potato Salad. This ready-to-serve salad makes a savory side dish to accompany all kinds of entrees, but it's so much more versatile. 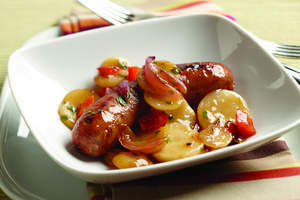 Think of it as a base for a hearty soup, a casserole or a skillet meal like Quick Sausage and German Potato Salad Skillet.